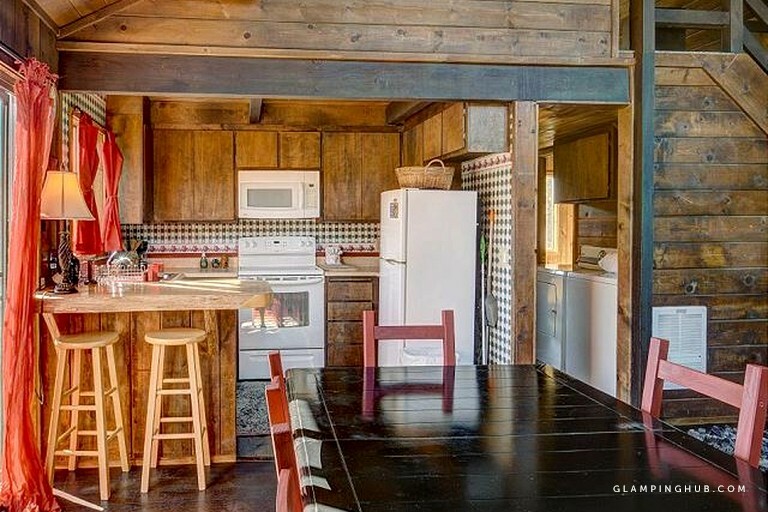 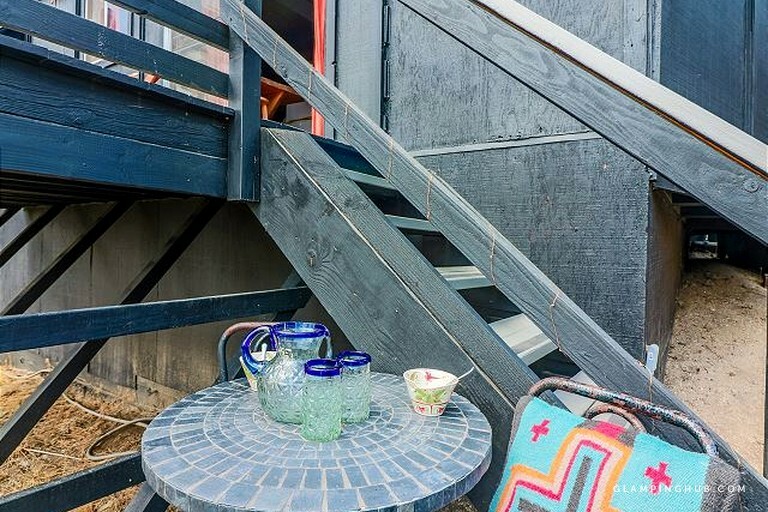 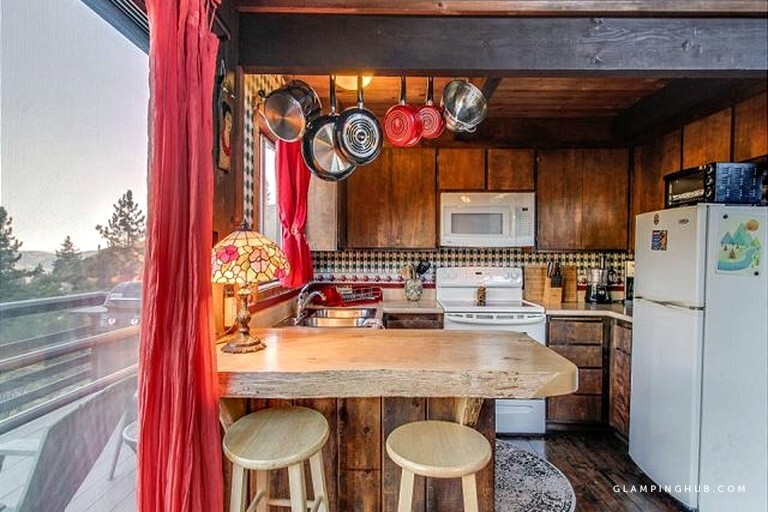 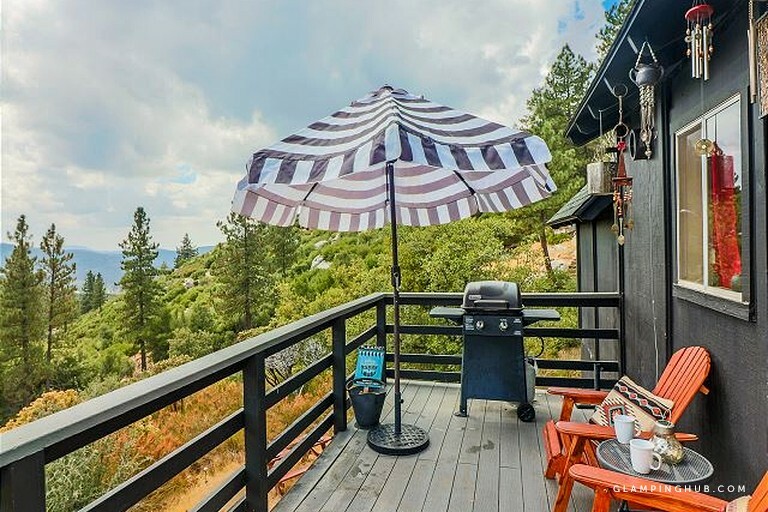 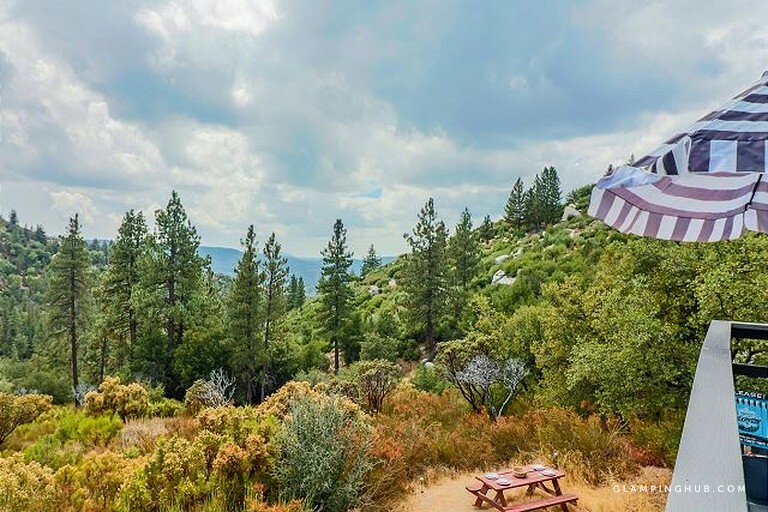 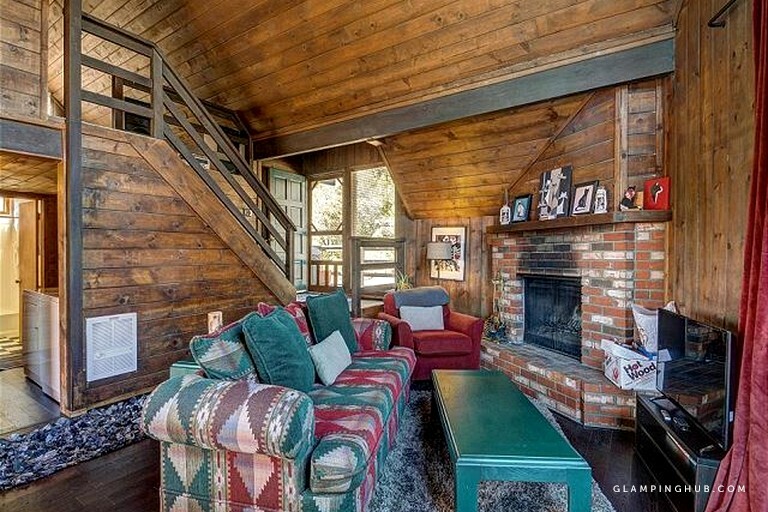 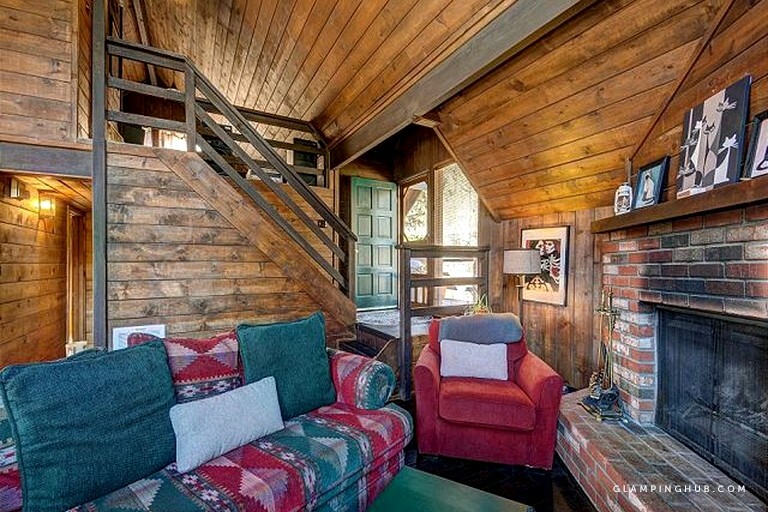 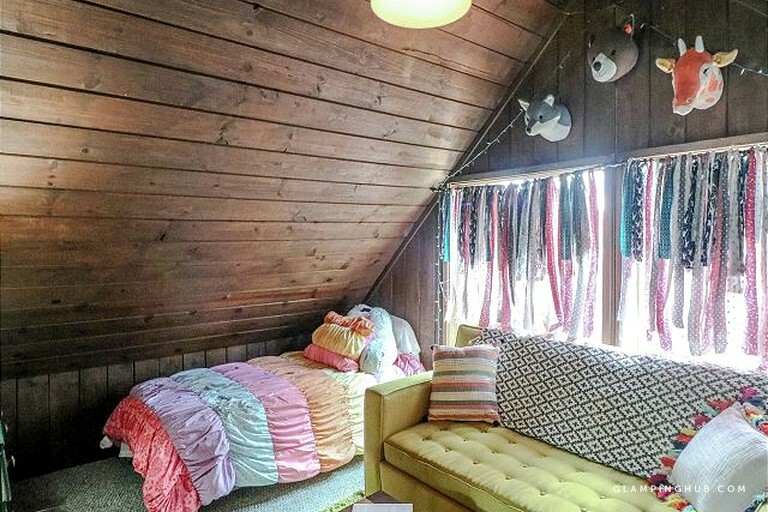 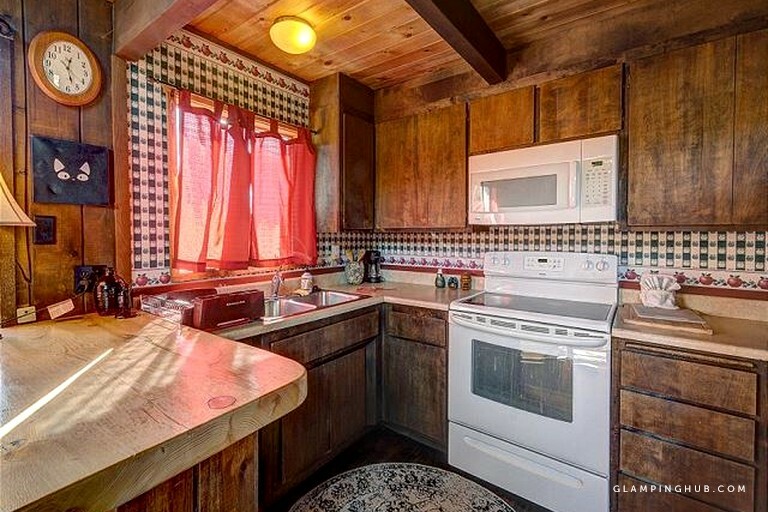 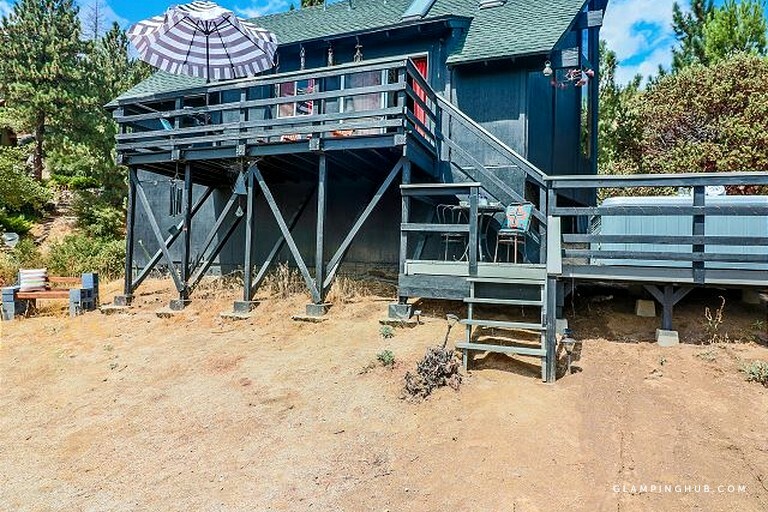 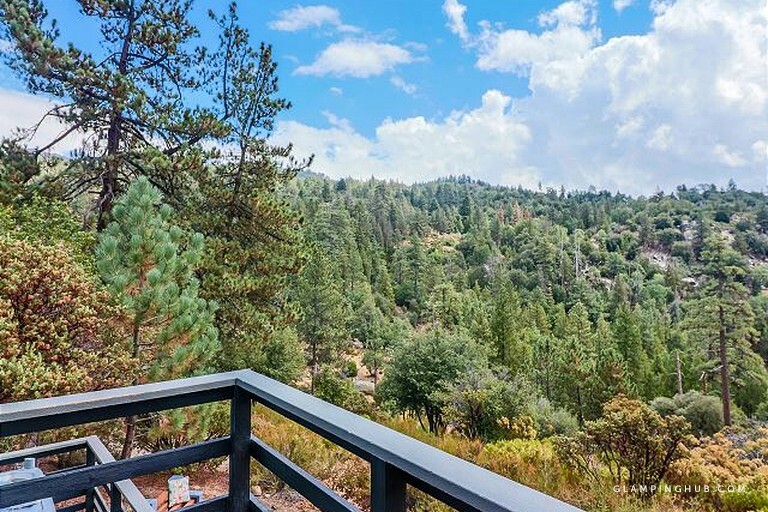 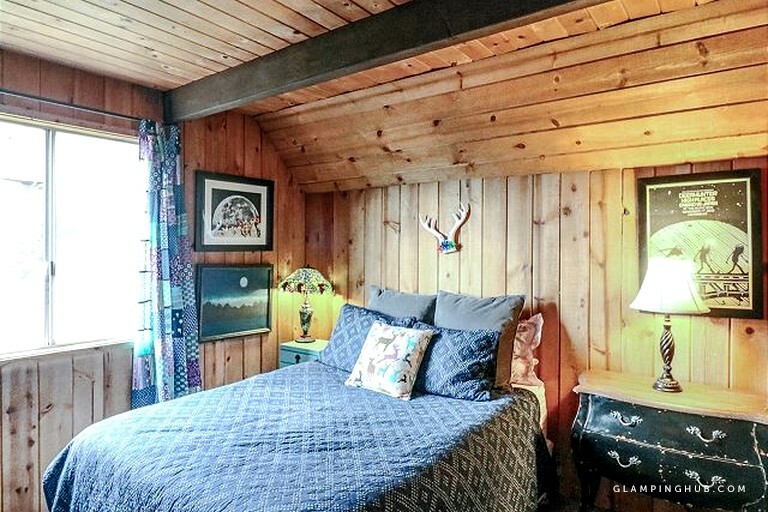 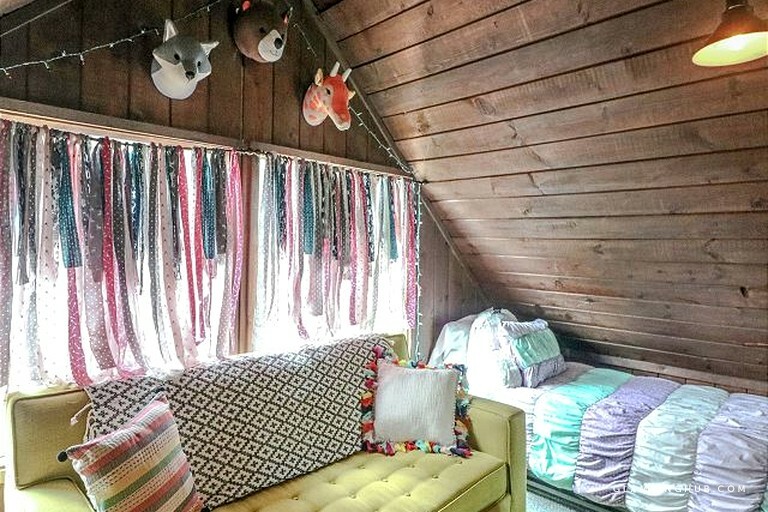 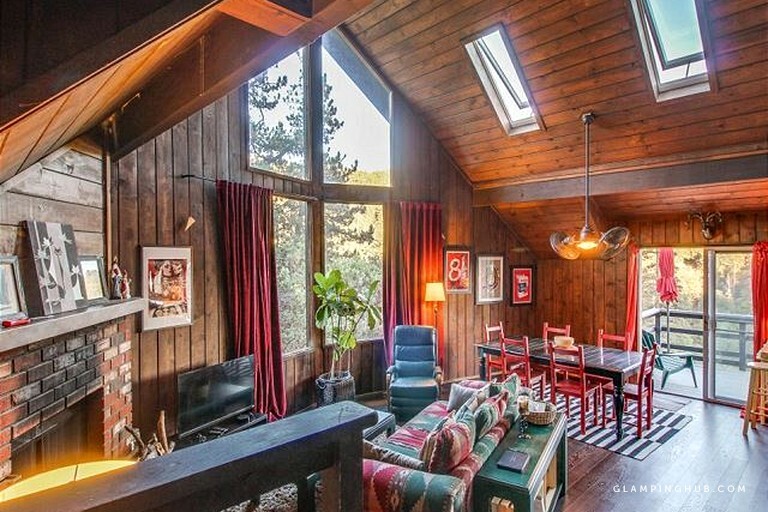 This charming cabin rental comes with a private hot tub and features a prime location near Hemet, California. 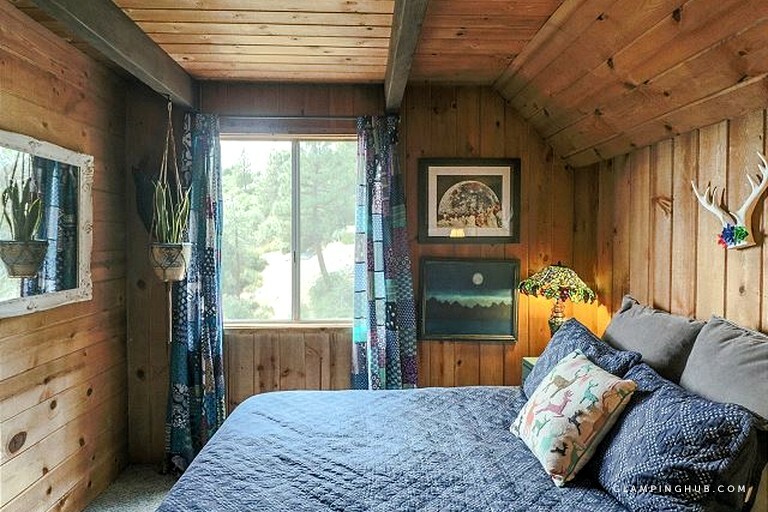 This cabin can comfortably accommodate up to six guests between two bedrooms, a loft area, one full bathroom, and one half bathroom. 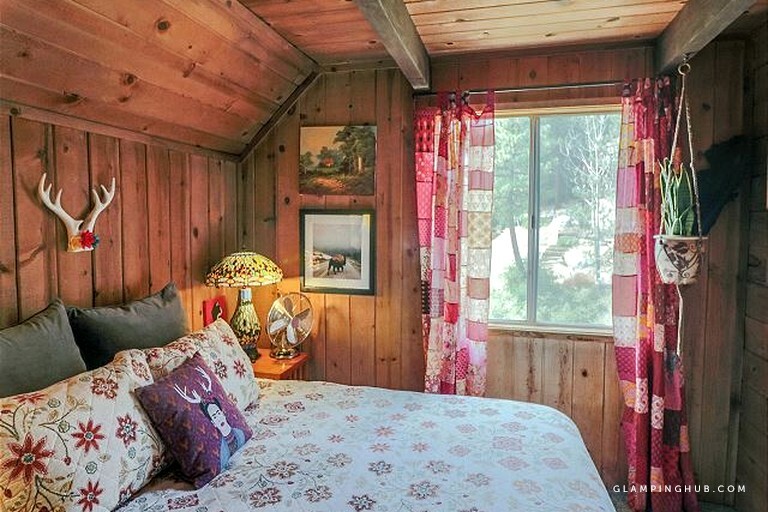 There is a queen-size bed in each of the bedrooms, and two single beds in the cozy loft. 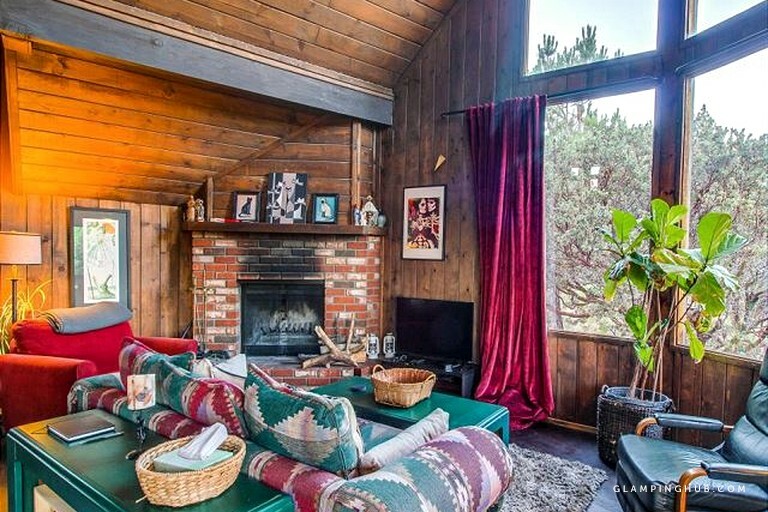 The spacious great room features a stone fireplace, ample seating space, a flatscreen TV, and a dining table with seating for up to eight. 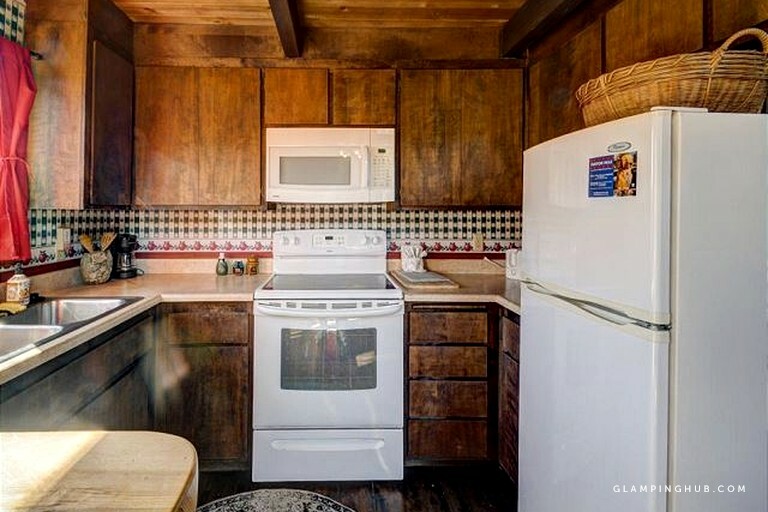 The fully-equipped kitchen contains all necessary appliances and cookware, along with a lovely breakfast nook with bar seating. 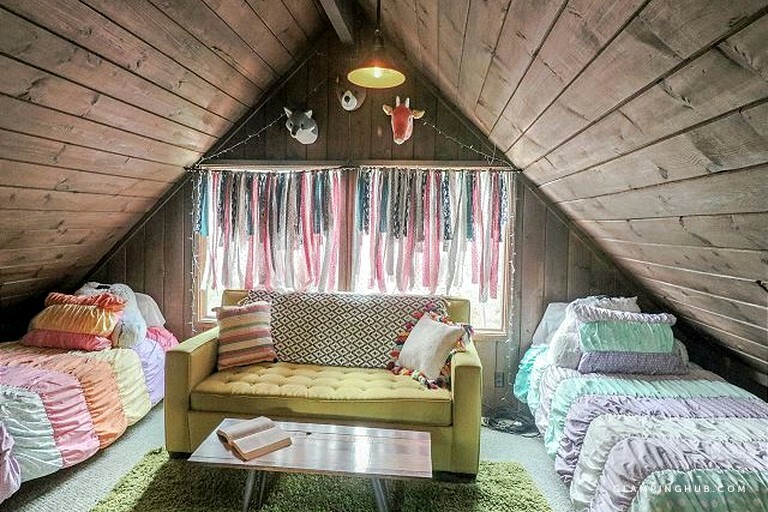 Both indoors and outdoors, this impressive glamping site will charm guests will a seemingly endless list of luxury facilities. 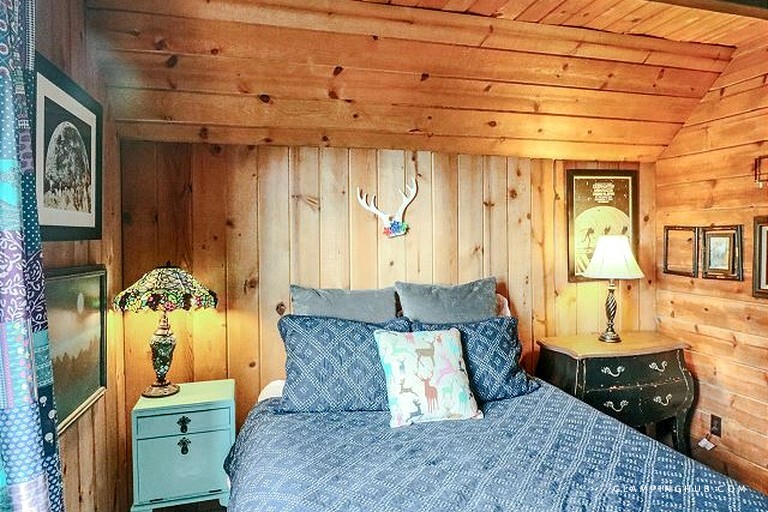 Indoors, guests will have access to wireless internet, Apple TV equipped with Netflix, and luxury linens. 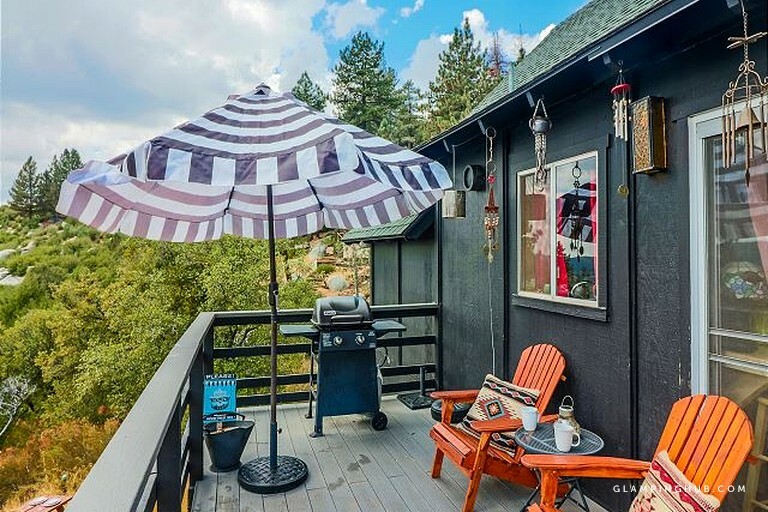 Outdoors, glampers will find a spacious deck with incredible mountain views, along with patio tables and a barbecue grill. 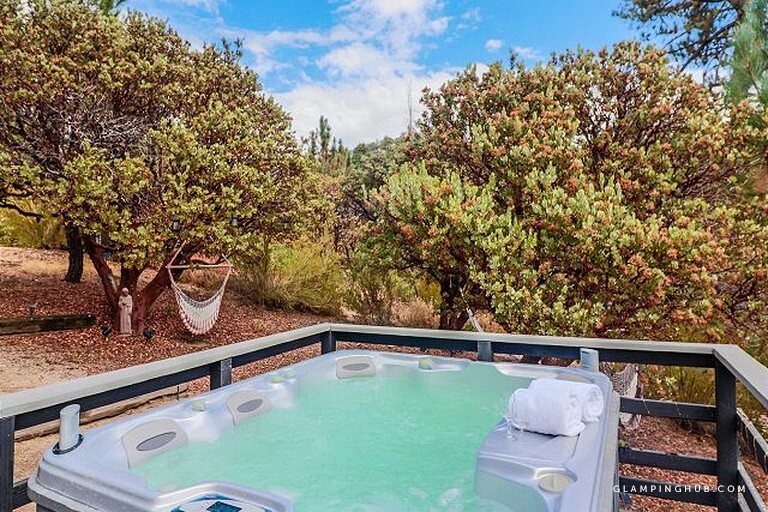 Most notably, guests here will enjoy a large hot tub with beautiful views. 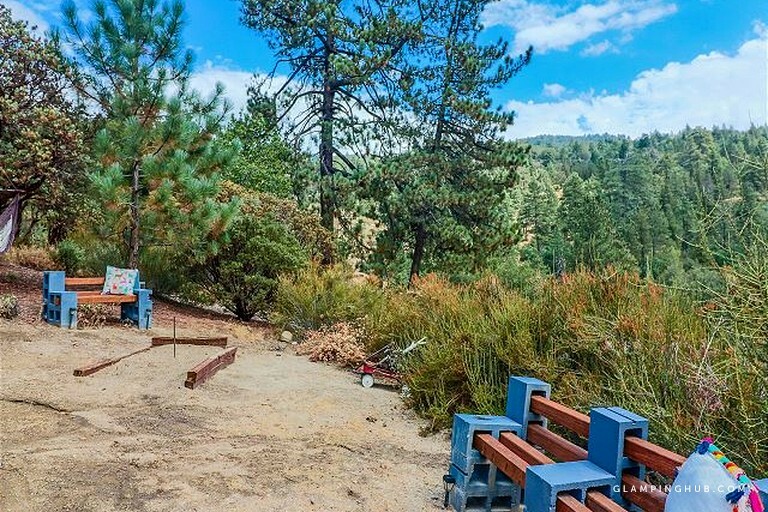 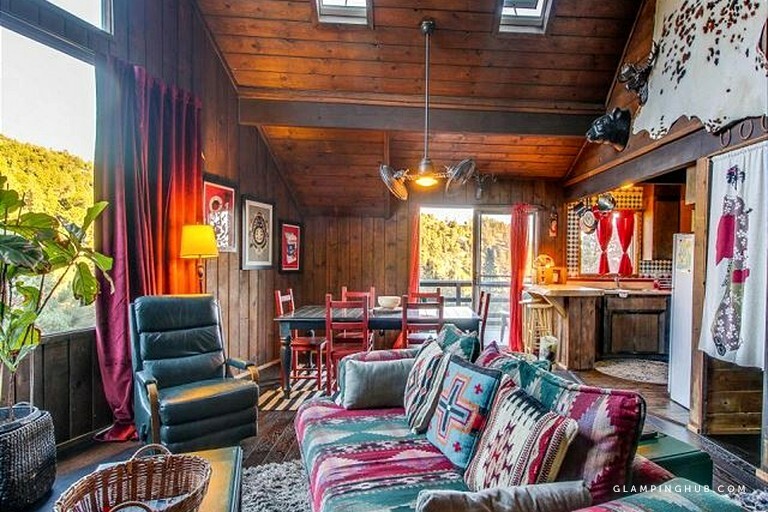 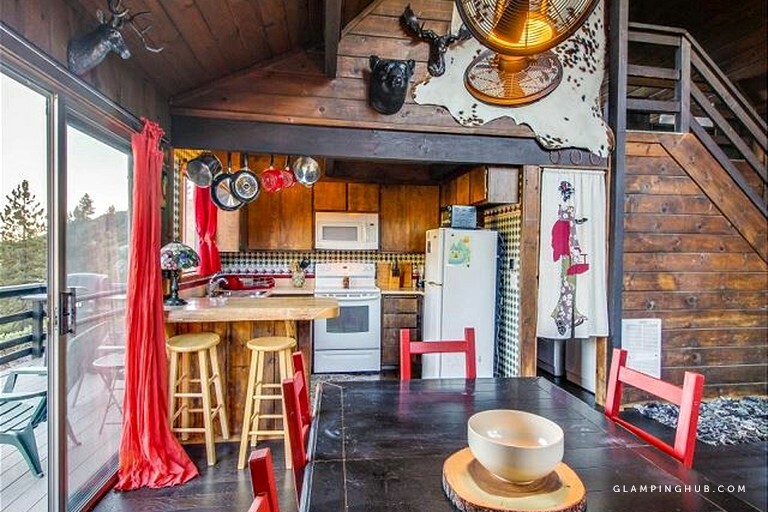 Glampers here won't even have to leave the property to have an amazing Californian getaway. 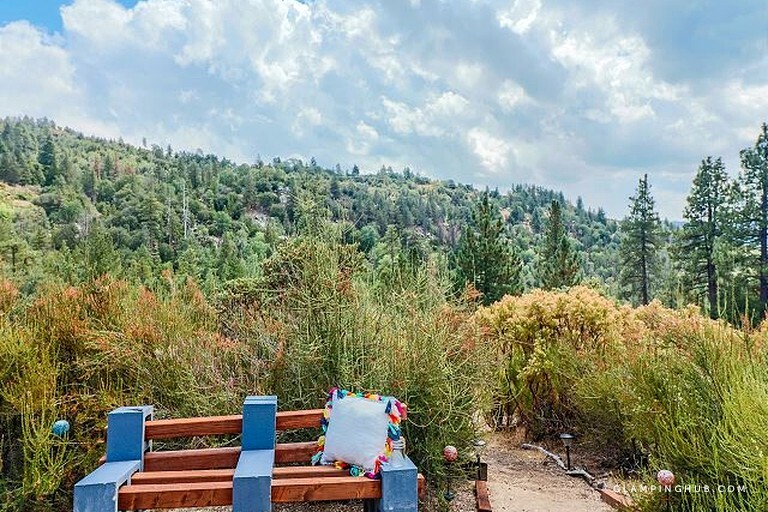 Guests can spend warm afternoons soaking in the mesmerizing mountain views from the deck and even catch sight of the local wildlife. 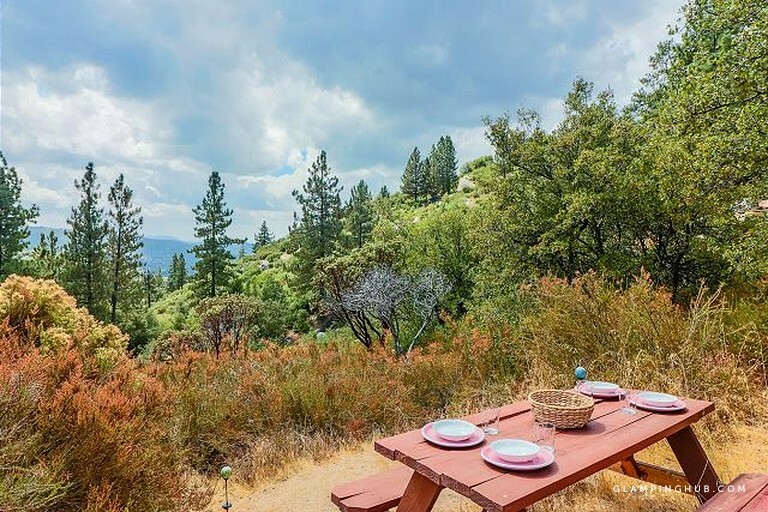 The outdoor barbecue is also ideal for evening meals with friends and family while enjoying the great outdoors. 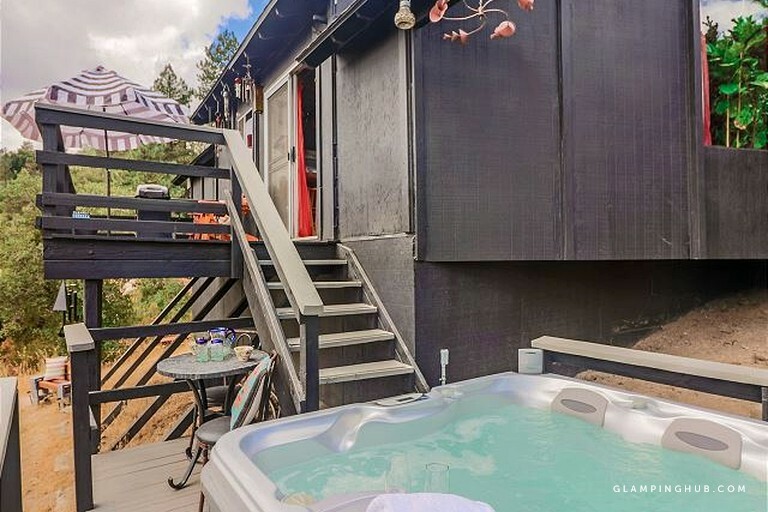 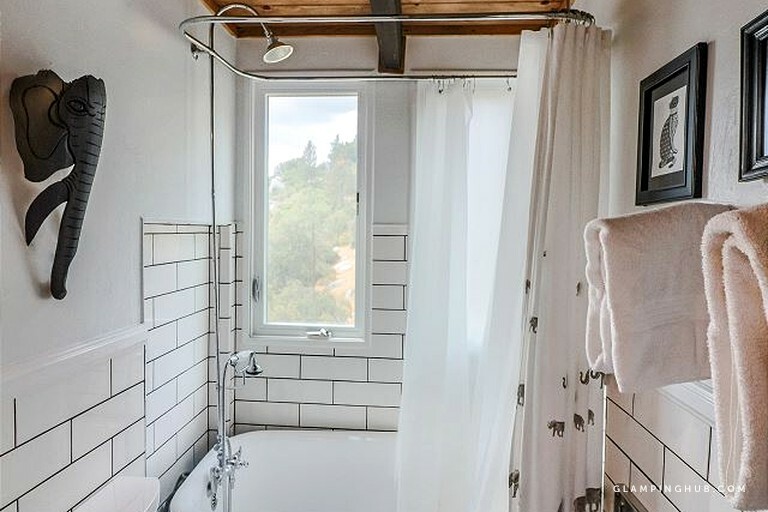 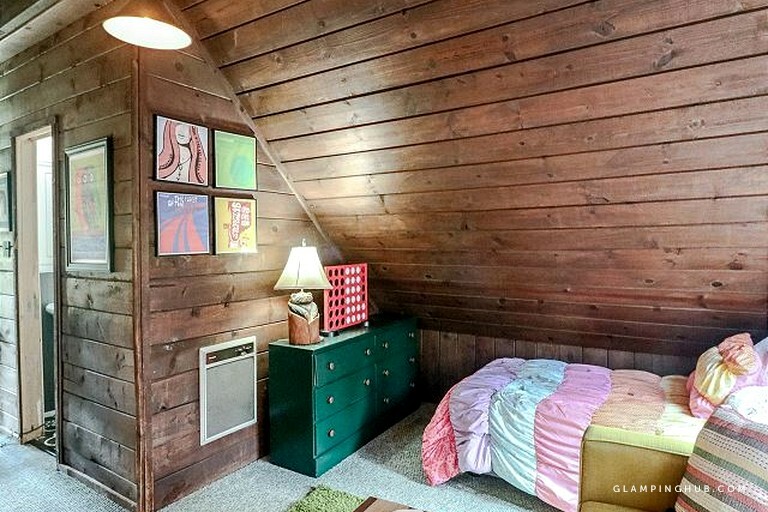 If glampers wish to get out and explore the area, they’ll be able to go on hikes, mountain bike, rock climb, swim, kayak, or even venture to town, which is just a 10-minute walk away. 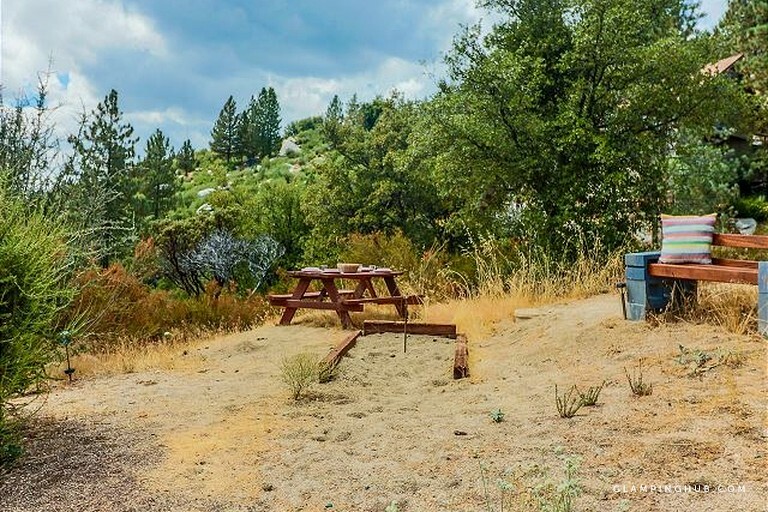 Nearby Lake Hemet is perfect for fishing, boating, or simply reading a good book in the warm sand. 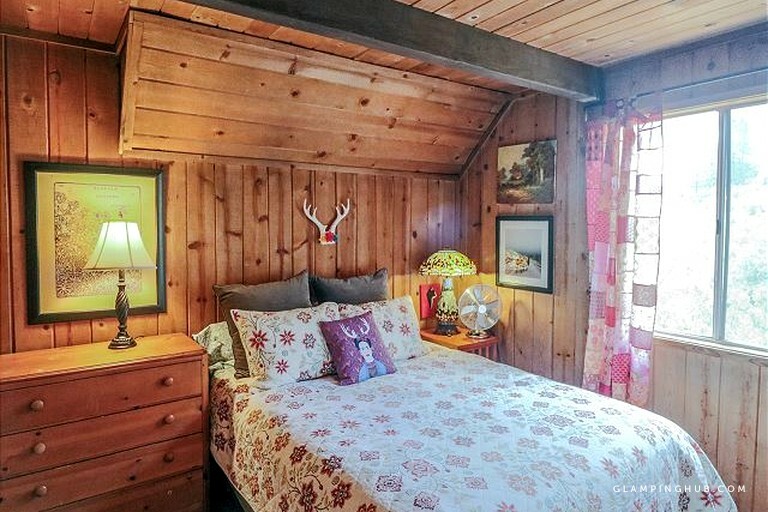 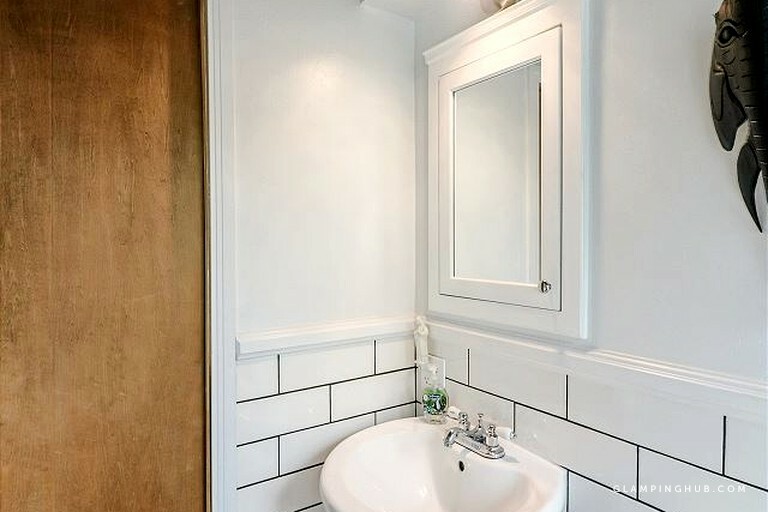 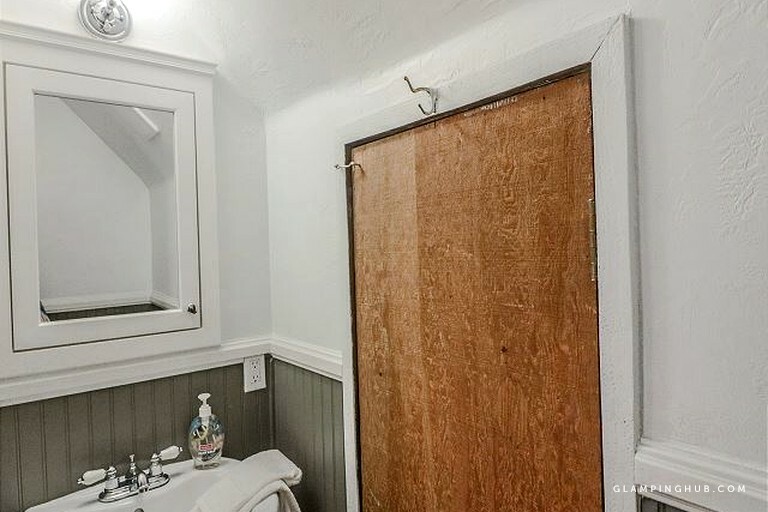 This property is dog-friendly for a small fee.